one of our all time classics a movie for all ages..spectacular animation..moral of the story..we are have a gift..use it! A wonderful family movie. Two thumbs up! loved it , so cute. Loved it great for the whole family! A great family movie at any time of year. 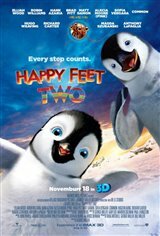 I enjoyed the Happy Feet 2 as well as the original. I would recommend this for kids of all ages. Erik is the cutest little penguin and waddled his way into our hearts! Happy Feet Two is cute, funny, a little sad; it touches on so many emotions. You leave the theatre with a smile on your face and a good feeling inside! Great movie! Love the music! Such a fabulous family film!!! Happy Feet Two was a movie that followed the original very closely. Great animation, AMAZING soundtrack and animated choreography. The addition of Krill (Bill & Will) put it over the edge into excellent. "one small step for krill-kind!" A good movie in the continuing saga of the Happy Feet sequel. So cute for any age! Great movie; better than the first Happy Feet. An enjoyable movie I will admit that there were a few scenes that were scary and may frighten some children. Just like the orginial great music and a fablous story. I love Mumble and Eric the power of the family and never giving up. Excellent, and very entertaining. Good for young and old alike.. Very touching especially when Erik sang "my father is a hero"... superb rendition..
Fabulous film for the whole family to enjoy! !